In 2006, I stayed at the Moab Rim Campark for most of the fall. After a series of unrelenting storms pushed me south to sunny Arizona, I made plans to come back to Moab and the Spanish Valley as soon as weather permitted. In the spring of 2007, I was back at the RV Park and ready to look at property. Jim Farrell, the owner of the Moab Rim Campark is also a local developer. After touring other available parcels, Jim suggested that I look at Pueblo Verde Estates, which is one of his development projects. Watch Moab Ranch - The Video here. Soon, I had money down on a one-third acre lot. At the time, only the roads and utilities were completed. Even so, I could see that this would soon become one of the premier developments in Moab and the Spanish Valley. Standing on level ground at the site, one has spectacular views in all directions. To the West is the Moab Rim, its crenulated sandstone ridge looks impossibly steep and tall. It reminds me of the Grand Canyon, but from the bottom, looking up. To the northeast is the La Sal Range, which includes several peaks greater than 12,500 feet in elevation. Over the next three years, I observed the development activities at Pueblo Verde Estates several times each year. During the build-out, my friend Mary Wright was the sales agent for the modular homes planned for each parcel. To help her efforts, I developed the Moab Estates website, which included the first live webcam from the upper Spanish Valley. When the economy slowed in 2008, the developers of Pueblo Verde Estates teamed up with the Housing Authority of Southeastern Utah. Over the next two years, the housing authority built high quality, affordable homes on each of the remaining lots. The unique project involved federal government grants and sweat-equity provided by the future homeowners. When completed, the project included more affordable housing units than any similar project in the history of that federal program. Now, those three-bedroom, two-bath homes are a financial and aesthetic credit to their owners and to their neighborhood. To view a larger image of the Moab Ranch webcam, click on the above image. In 2008, I realized that the remaining Ranchettes were an untapped treasure for their future owners. Each Ranchette is almost 2.5 acres in size and includes surrounding open space, dedicated to that purpose. Access is via wide paved roads, which include concrete curbs and gutters. Underground utilities, include water, sewer, electricity, natural gas, telephone and cable TV, all of which are in and paid for. In order to inform prospective buyers, I developed the Moab Ranch website. Recently, I completed an update to that website. Now you can view the remaining Ranchette on an interactive map and take a video tour of Moab Ranch. 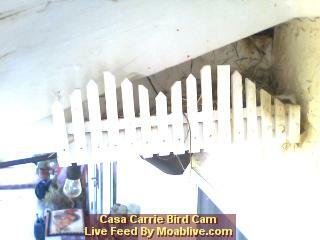 Additionally, you can view a webcam that streams live from the property. Author's Note - November 10, 2013: When the word gets out that only one horse property, complete with unobstructed La Sal Range views, is available for $95,000, the final Ranchette will sell fast. No other property in Moab has all of the amenities you will find at Moab Ranch, at any price.